For those who have never participated in a triathlon, the idea can be pretty intimidating. After all, running in a race can be hard enough, so adding swimming and cycling may seem like a recipe for torture. 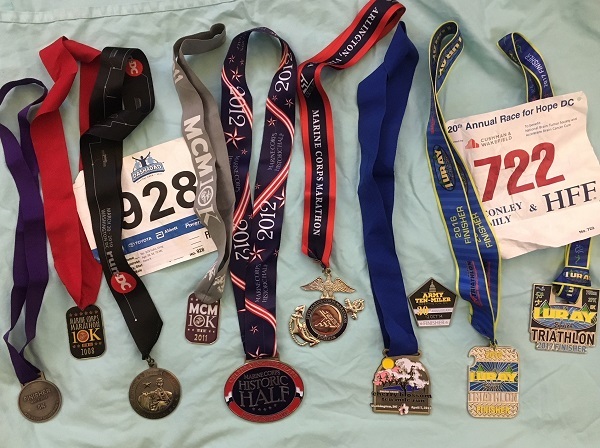 When some friends approached me in December 2015 about doing what would be my first tri (and I had a long history of running in races, all the way through a marathon), I initially scoffed at the suggestion. Were they insane?! A triathlon?! But I’m glad they persisted, because after some additional discussion and thought, I realized that my completing a triathlon probably was not only achievable, but could be fun. So I finally signed up, and in August 2016, at age 43, I completed my first tri. In fact, I enjoyed it so much that I did another one the following summer, and as of this writing am looking forward to my third tri coming up in just a few weeks. 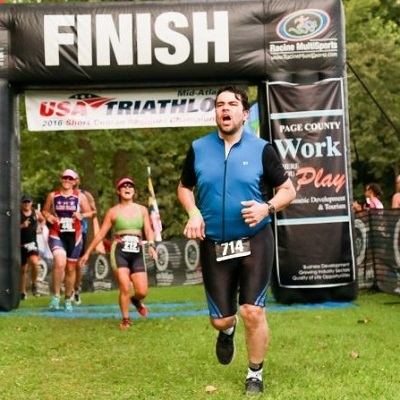 Crossing the finish line at my first triathlon in August 2016. It was challenging but fun! For those who have never done a triathlon but might consider it, here is some information that may help you decide whether to give it a shot. Ironman: a 2.4-mile swim, 112-mile bike ride, and 26.2-mile run. These distance may vary some. 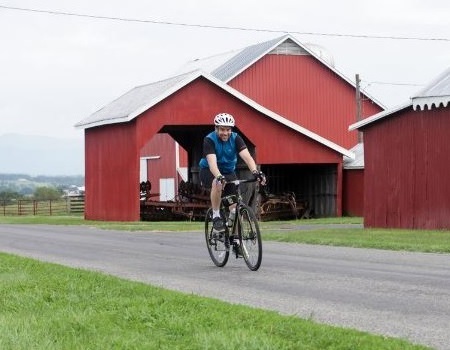 For example, the Luray Sprint Triathlon in Virginia – which is the one I’ve completed – has a 16.77-mile rather than a 12-mile bike ride. In addition, while most triathlons feature open water swims and road biking and running, there are variations such as indoor pool swims, mountain bike rides, and trail runs. There are also tri-inspired races featuring only two events, such as aquabike (swimming and biking), duathlon (biking and running), and aquathlon (swimming and running). One of my favorite triathlon features is the variety of exercises. I enjoy running, including in races, but my biggest challenge is always the training. In preparing for a run event, while there is some variety to the workouts, ultimately one is focused on a single activity: running. While healthy overall, I find this can get a bit dull and can be taxing on specific muscles and joints that see more activity than others. With a triathlon, one still needs to run. However, the training also incorporates swimming and biking, which opens up a whole new world of exercise. It is also advisable to include activities like weightlifting (particularly early in the training cycle), yoga, and various cardio workouts into one’s routine to build cardio fitness as well as strength, endurance, and flexibility across a wide range of muscle groups. I’ve found that while the training is challenging, it is also fun because of this variety. The tri got me into a pool for the first time in decades, and being in the water made me feel like a kid again. It pushed me to discover a network of biking routes around my local area and ride further and faster than I ever had, which was exhilarating. And hitting the weights, the elliptical, and yoga classes more frequently kept things interesting. Also, most of these exercises are low-impact, so while I put in a lot of hard work, I had no noticeable increase in soreness or injury versus just running. In fact, my fitness improved in a more holistic way, since I was doing more varied cardio exercises and working more muscle groups. Luray has some gorgeous scenery to enjoy during the ride. In addition, one does not need to be “tri ready” on Day One of training. When I first hit the pool about five months before my first tri, I could only swim about half the required distance. I also had never really done long-distance road biking, being more of a mountain biker, so it took time to adjust to a different style of riding. But with a sustained effort one’s abilities can develop quickly, and within a couple of months I was able to swim a half mile or ride 17 miles without stopping. From there, it was a matter of putting all three events together. About six weeks before the race I started doing some “two-fers”, such as going for a swim followed by a bike ride or a ride followed by a run. I also did an open-water practice swim to familiarize myself with swimming in a lake (which can be intimidating to the uninitiated). Then a few weeks before the race I did a mock Sprint triathlon using my local pool and training routes, just to make sure I could handle all three events at once. I finished successfully, which greatly helped my confidence going into the actual race. Triathlons are a big commitment and should not be taken lightly. Even a Sprint requires months of training and can take an average person anywhere from around an hour and a half to over two and a half hours to complete. While I enjoy triathlons and think many other runners would too, I recognize that they aren’t for everyone. For one, they can be relatively expensive, given the need to purchase running, swimming, and biking gear. Further, triathlons are inherently more dangerous than run-only races due to the risks of open-water swimming and the faster pace of bicycles in a race environment. Finally, triathlon training requires more specialized skills and environments, which makes it less accessible than just running. able to complete a half-mile open water swim, but it was worth the effort. Most importantly, while triathlons generally are safe and closely monitored, it is essential that a triathlete feel confident in their ability to handle all three race segments, or it is probably not a good idea to sign up. Of course with training these skills can be developed, but they must be developed because there’s little margin for error when traversing open water with no life jacket, or flying downhill on a bike at 30 miles an hour with other riders all around. If one is interested in attempting their first triathlon, I’d recommend starting with a Sprint (or perhaps an aquabike, duathlon, or aquathlon). As for me, I’m about to complete my third Sprint, and only if I finish in under two hours (my PR is 2:12:47) will I consider working toward an Olympic distance. I likely won’t attempt anything longer than that, and I’m at peace with this. As with any race, you’ve got to know your own limits, goals, and preferences. With that, I hope this helps you in deciding whether to try a tri. Whatever you decide, good luck and happy trails! I love the journey! Keep up the great training. The Boston Marathon is the world's oldest marathon, and marathon runners from around the world aspire to run it at least once so they can honor its history. Despite its global appeal, the Boston Marathon belongs to the people of Massachusetts, and the 26.2 miles from Hopkinton to the finish line on Bolyston Street feature some of the best crowd support runners could ask for. After I received my acceptance to run in the 2019 Boston Marathon, I immediately put together a playlist of songs about Massachusetts or by artists from Massachusetts as an homage to the locals who will be lining the streets to cheer on me and thousands of other runners on April 15. I am an avid runner, but it’s probably more precise to say that I have a love/hate relationship with running. I seldom really want to run and sometimes even dread it, but I run anyway because I know it moves me toward greater physical, mental, and emotional fitness and allows me to live a more fulfilling life. And once I drag myself onto the trail, often the dread subsides and gives way to a nearly transcendent experience. 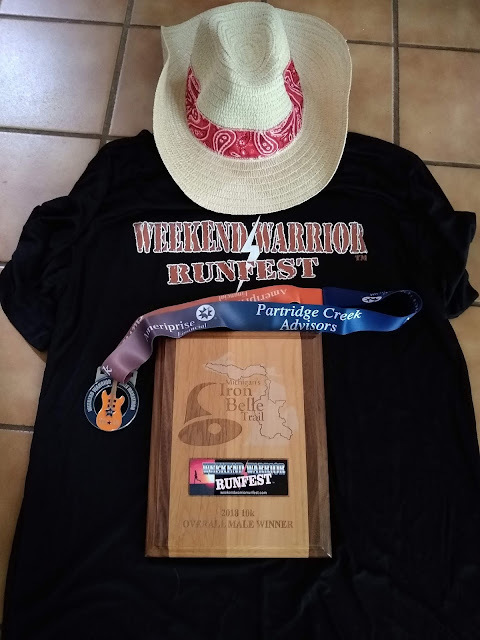 I've raced 5Ks, marathons, and half marathons, but I had never raced a 10K until this past weekend's Weekend Warrior Runfest in Shelby Township, Michigan. The Weekend Warrior Runfest is a local event with 5K, 10K, half marathon, and mile races. Walkers were welcomed in the shorter races. The number of entrants for each event was small, with the half's 90 entrants being the most. The 10K that I ran in only had 32 finishers. The race is country music themed, with live musicians at the start/finish area and along the course. I believe only the musicians at the start/finish area were plugged in, but it was still nice to have acoustic music along the course, even if it wasn't very loud. The country theme included cowboy hats for finishers, which I gave to my six-year-old daughter (she loved it), as well as a medal with a guitar on it.